The Sifted Generation casts an eye-opening look at the state of the church and the state of the world, in relation to the events that precede the return of the Lord. The Bible reveals that as this day approaches, there will be a structure to the world that positions the nation of Israel in a regathered state (Aliyah) while world opinion against her begins to form. Technological advances will provide a worldwide “Big Brother-like” reality and international economics will grow in volatility. During these days, the Bible teaches that Christians will become hated and persecuted, as the salt and light—the preserving and restraining attributes of godliness—are disdained as nonsense. As hostilities rise, true believers will also be seen rising to face the spiritual battle. With the sword of the Spirit swinging, the shield of faith sustaining, and the breastplate of righteousness protecting, they will rush forth in a valiant defense of the faith that was once and for all delivered to the saints. The evil that will foment against the church serves to expose those who have fled from the truth of Messiah, revealing with clarity the slicing power of the heavenly scythe, which will clearly delineate those who are Christ’s from those who are not. But I believe there is something else going on in the world…something that tells us the curtain call of the Church is about to be raised. With hostilities thinning the ranks of the Church and the Lord sifting her loyalty, via the mass acceptances of the deceptive doctrines that have slithered under its threshold, the principalities and powers behind the world system will make it a fashionable thing for hordes of humanity to rebel against the truth. No longer fearing God, a looseness of morality will surface, linking a pseudo boldness with courage, and causing millions to turn against Christ. Little do they know that their rebellious ways are an audition to take part among the cast of characters that will set the stage for the coming days of tribulation—the days of anguish—which will make up the final seven years before the Lord returns to set up His Millennial Kingdom reign. We are…The Sifted Generation. Upon Christ’s Return a Generation of Saints will be Found Defending the Faith… Will You be Among Them? 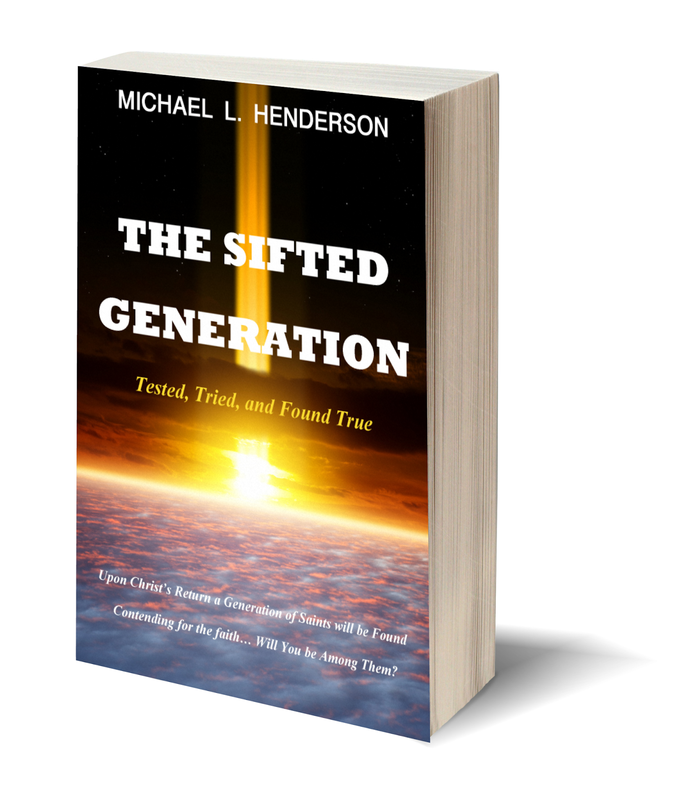 The Sifted Generation is not just another book on events unfolding in the last days. It is a book that will help open the eyes of many in the church who are blind to the times in which we live. It is an expose' that reveals the enemy within the church and culture along with the philosophies that lured her away. Moreover, it will make the believer deeply consider the seriousness of the words of Jesus when He said, "Whoever desires to come after Me, let him deny himself, and take up his cross, and follow Me" (Mark 8:34 NKJV). In His Olivet Discourse of Matthew 24, Jesus spoke of these things. He spoke of wars and rumors of wars, false messiahs, earthquakes, famines, disease, pestilence, and the love of many growing cold. Was He just giving us a general accounting of events spanning the centuries ahead? Or could there be a pattern in all He said? In the midst of these things He stated that death would be the lot of many of those who followed Him. What Jesus revealed for believers of the future church was faith on trial. He saw that many, from the first generation of Christians until the final, would pay the price of their faith in blood; and in the end, during that final generation of faith, situations on earth would not become brighter but instead, progressively worse. For the Christian the days ahead will be days of testing; testing that will prove the mettle of our faith. Will we stand with Christ or against Him? Can we confidently say that we will stand? These are the days in which God’s justice is vindicated; no one will have a valid excuse for their unbelief. Every believer will be known and every unbeliever will be identified. How does this begin? And why does this need to be so? Again, The world today is inundated with feelings of fear and uncertainty about the future. War and religious rivalries—acts of hatred, racism, and cold-hearted aggression against Christians and minority sects are the headlines of newspapers, the top stories online, and lead the evening news. Atrocities of barbaric proportions—things that have not been seen since the Nazi holocaust of the 1930’s and 40’s, the eras of Hitler, Stalin, Lenin, and Pol-Pot—are again happening in the Middle East, Africa, and Eastern Europe—events that are about to bring the world to another large scale war. The people of the world do not have answers to these issues. Even though humanism touts that mankind has the answer for all of the world’s ills it is yet to provide a solution. The Bible foretold these days in no uncertain terms. Jesus was clear; there would be wars and rumors of wars, false Messiahs, persecution of His followers, and general unrest worldwide. He said the days were coming when those who killed the saints would think they were doing God a service (John 16:2). Things are indeed coming to pass just as Jesus foretold. When approached by His disciples concerning the day He would set up His kingdom on earth, Jesus spoke of a final generation of people that would live in the midst of atrocities so intense—so fearful—that unless He intervened to bring an end to them no flesh would be saved (Matt. 24:22, 34). He was very clear about the troublesome conditions on earth that would lead into this era and I believe the current days we are living in are those leading days clearly foretold by the Lord. I believe the final generation from which He calls His faithful church into eternity is here. I believe more than ever, that today’s generation of Christians will make up The Sifted Generation. Every generation since Jesus ascended to heaven has had to go through a form of sifting. During the days of the first advent of Christ the people were sifted by every word He spoke. The crowds, lawyers, scribes, and religious leaders either sided for him or against him. His words were like daggers skillfully placed to incise and dissect the thoughts and intents of every heart. Skillfully He separated the bone from the marrow of thought revealing to the crowds whether one had faith in God or did not. From those crowds sprang forth a band of faithful followers, many of whom would one day pay the ultimate price of faith—their life. Each generation since has had to face the question of whether to continue to trust and believe in Christ or not. Is our generation any different? No. Today more than ever, God is calling Christians to make a bold stand. Our goal is to glorify God and take the gospel of His saving grace into the unfriendly world of unbelief. Our goal is to shine His light into the darkness of life uncovering the despair and futility in all the world has to offer. Many a soul has been ruined by the rampages that sin imparts, and many a family torn apart. Even though the answer to all this suffering is found in the Lord Jesus still the world refuses to seek Him and the cries to crucify Him can still be heard across the lands. This is our world today. This may be the one book that will open your eyes to the biblical instruction needed to not only understand what is going on around you but why humanity is about to be sifted more than any generation before it. Christ will soon gather the believing church into the clouds of heaven. What follows that separation of the saints are seven years of the most trying circumstance ever known to mankind, an unleashing of horror such as the world has never seen as the restraint of evil is removed from the earth. By necessity I believe we need to first understand that Christians should not be surprised that hostilities would rage against us in the final days. If we take the Bible at its word, then we should realize there is a spiritual war going on all around us of major intensity (Eph. 6:10ff). We are first introduced to this spiritual battle in Genesis where Satan is found in the Garden of Eden contradicting God’s promises, tempting Eve to ignore them, opting instead to follow his deceptive instruction. In the waning chapters of the New Testament (Revelation 20:10), we find this same tempter again; only this time we read about his end—a lake burning with fire and brimstone; and that is only part of the story. In between the pages of Genesis’ beginning and Revelation’s end we have the history of God working in and through the lives of untold generations. Some of it is historical, some of it is prophetic, but all of it is instructional. It teaches us that God’s purpose for humanity was to live in fellowship and harmony with Him, but humanity broke that trust. Before Jesus was crucified He was still praying we would come back to Him. Recorded in John 17 is His prayer to the Father, “that they all may be one, as You, Father, are in Me, and I in You; that they also may be one in Us, that the world may believe that You sent Me” (John 17:21, italics mine). Jesus is not praying that we be equal with God but that we are to be one in intimacy with Him—with the things He cares for; and so the Bible was written to that end. It begins with a record of mankind’s perfect unity with God at creation, prior to Adam’s fall; and ultimately leads to the restoration of that perfect unity, a restoration that can only be found by faith in Jesus Christ. The culmination of all things is upon us. Only now, in this final generation, can we truly see with clarity the things that are about to take place. In the approaching days before the Lord’s promised return, persecution against the saints goes full-throttle. In order for us to stand strong we must understand the meaning behind it all. In looking at the passage quoted from John 15 at the beginning of this introduction, Jesus used the word Hate to describe the reaction of non-believers toward Christians. Hate is a tough word. At its mention, negative connotations arise that envision cruelty, oppression, and wrath. But as harsh as the word may sound, it suitably describes the driving force behind the angry confrontations and cleverly devised activities of those first century antagonists who opposed Christ as Messiah. More importantly, it is the word of choice Jesus used to describe the future emotional sentiment of the world toward Christians by those who refuse to trust Him as Savior. These emotional outbursts against believers would serve bring two things to light: They would serve to sufficiently identify one as a Christian and prove that by association with Him they would face many of the same offenses He did. This camaraderie of oneness in character working itself out under the banner of suffering hostilities serves another purpose as well; it also sifts or distinctively separates the true believer from those in name only. Those who are truly His hear His voice and respond positively to His loving call, even if it means hurt, loss, or ridicule. Jesus made this clear when He affirmed, “My sheep hear My voice, and I know them, and they follow Me” (John 10:27). This means that when we hear Him speak we make a conscious choice to follow our Shepherd even into unknown and stormy pastures. The non-believing crowds cannot understand this concept, not to mention the absurdity in how they perceive it. The thought of a holy God who speaks intimately to His followers just doesn’t meld well in a culture that only tolerates the authority of another if there is personal benefit; submission for any other reason is outrageous. This is what Jesus meant when He said, “…these things they will do to you for My name's sake, because they do not know Him who sent Me” (John 15:21b). It’s also why Jesus could say to His persecutors on the cross, “…Father, forgive them, for they do not know what they do” (Luke 12:34b). True believers know the voice of the Lord. We hear His voice and we commune with Him daily. We desire to live a life that pleases Him, even if it means having to separate ourselves in action and fellowship from those who do not know Him in accordance with the wisdom of the Spirit found in 1 Corinthians 15, “Do not be deceived: ‘Bad company corrupts good morals’ " (1 Corinthians 15:33 Holman Christian Standard Bible). In short, active followers of Jesus cannot go through a day peacefully without speaking in some way with Him in prayer. It is He that supplies our nourishment with the manna from heaven giving us strength and courage to face the day ahead. The fact that He had to warn us we would be hated speaks clearly of the effect the “New Birth” would have on society as a whole. In John 3:3, Jesus introduces this new birth event with reference to one needing to be “born-again” spiritually, in order to see the work of God and experience entry into His kingdom. He explains spiritual birth by comparing it to (or, perhaps, ‘contrasting it with’) physical birth.” Both set a person on a path of life but the physical ends in death while the spiritual is eternal; just as one must be physically born to experience the earthly life, so one must be born again spiritually to experience the heavenly. This new heavenly birth is the catalyst behind the transformation in character found in those who are true believers in Jesus. Our physical nature still exists but our thoughts, decisions, and affections are now enabled to desire heavenly things while the natural desires of the former nature are set to fade away. One would think that a transformation in character from selfishness and pride to bearing the fruits of kindness, goodness, faithfulness, love, and patience—from being hateful, cold, and harsh to caring, kind, and gentle—would be appealing to the public; but time has taught us that it’s not beholden by all. Instead, little-by-little, it has produced a great divide that has come to the point where being a bible-believing Christian in many circles is synonymous with insanity1 and bigotry!2 To be sure, there are some so-called Christians who do not follow the directives of Christ. These have helped to inspire the word hypocrite as the politically correct label to lump Christians under, but in reality it’s a cop-out, an excuse for many to put off the inevitable—that face-to-face meeting that all will have with Jesus Christ. In this world there are genuine Christians everywhere loving and serving the Lord with utmost humility and respect. To reject eternal life because of the hypocrisy of another is shallow reasoning and it will never change the facts. No matter how justified it may make one feel to castigate Christians, it cannot negate the accountability that the Lord mandates to all people on the coming Day of Judgment. For all will be required to give an account of themselves to God, (see Rom. 14:12). When the Holy Spirit spoke to me through inner conviction and revealed to me that I was supposed to write this book, I was immediately inundated with peace. Ironically, this overwhelming peace occurred in spite of the hostilities brewing in social, political, and cultural circles that Christianity now finds itself the focus of. I believe now, more than ever, the choices we make on a daily basis need reexamination; they are sure indicators of where we place our devotion—to what and whom we trust. The times of giving God lip service are over. It is urgent that we know where our loyalty resides. Being in the “Company of Christ” means laughing with Him, crying with Him, suffering with Him, and caring for the things He cares for. If the Christ-life becomes our life, at some point in our earthly existence, we will be faced with having to swim against the tide of the culture’s politically correct conduct to make a stand for what is right. Is our heart prepared for this? Jesus once made a very profound statement that still speaks loudly today. He said, “…For the mouth utters what the heart is full of” (Matthew 12:34 (MOFFAT)). Our actions, our conversations, our affections all reveal our heart and it is that heart that touches Jesus and in turn, the world. It will either glorify God or it will not. Soon the Lord will be coming with the clouds (1 Thess. 4:13-18); while there is still time it is urgent that we make most of the time we still have and get right with Him now. Please do not wait. Go now to Appendix B, How to Get Your Life on God’s Path. This book is really a book of hope. I longingly desire that through its pages your faith in Christ will become stronger and bolder; that despite the hostility you or I may face as a Christian, we will not let Jesus down. The salvation of souls everywhere depends on our faithful obedience to the command of Jesus to go and make disciples of all nations teaching them to observe (keep) His word (see Matt. 28:18-20). He went to the Cross for the joy that was set before Him. That joy was your salvation and mine. He has been through the same tribulation and pain we experience. He understands how tough it is to stand against the tide. As a fellow believer and worker with you in God’s army, I am praying that your faith will prove to be strong in the days ahead. We all need to trust Him by faith that He will carry us through. So as I explore the many facets of hatred hurled at Christians, I make a pledge before God to do so on a non-discriminatory basis. However, we will explore in depth why accusations are made and insults are hurled; why there is so much vitriol in many lives against the Church which has been a beacon in American society since its beginnings, and why this wall of indignation has been unjustly erected. I want to explore our actions, emotions, affections, beliefs, and constants. Lastly, I want to ask some hard questions and really get to the bottom of this great moral divide the world is in the midst of. It is my prayer that you will walk through this with me with an open mind and a heart for unchanging truth. ** I do not, and absolutely will not share or publish or sell any email address.